Mix oatmeal, flour, brown sugar and butter/margarine. Spread 1/2 of mixture in the bottom of an 8×8″ pan. 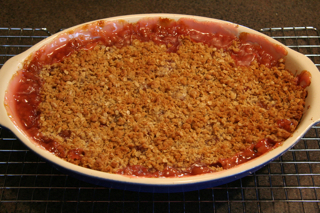 Evenly spread chopped rhubarb over crust. Combine sugar, water and cornstarch in a saucepan. Boil and stir until thick and bubbly. Remove from heat. Add vanilla and pour over rhubarb. Sprinkle remaining crumb mixture on top.